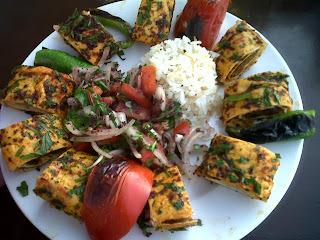 Beyti kebab is a Turkish dish consisting of ground beef or lamb, grilled on a skewer and served wrapped in lavash and topped with tomato sauce and yogurt. Mix ground lamb with the coriander, cumin, black pepper, red pepper flakes, and salt. Leave to sit in the fridge for about one hour. Form meat into patties 3 cm x 15 cm. Preheat barbeque or grill, coat with some olive oil. Cook meat on a medium-low heat for about 15-20 minutes. The meat is ready when it is springy. Turn the meat often. Cook the onion in olive oil. Add a sliced tomato, a can of tomato sauce and some pepper to taste. Wrap the meat patties two times round in thin pita bread. Cut the wraps into bite size pieces and arrange in a circle on a plate. Lightly drizzle the wrapped meat with the tomato sauce. Add yogurt, parsley, and a side dish (rice, couscous, bulgur) in the center of the circle. This kebab is quite tasty and filling. One of the highlights of this kebab is the set up of the plate, which provides an excellent balance of meat, side dish, garnish, and yogurt.